"This salsa is sweet, tart and fresh, like a perfect summer day. Raspberries are blended with the vibrant flavors of jalapeno and cilantro to create a crowd pleasing topper for pork and other savory foods." 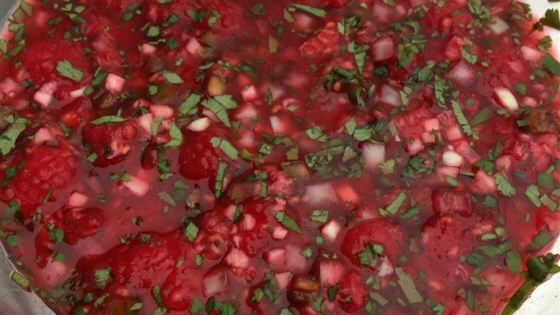 In a medium bowl, mix together raspberries, sweet onion, jalapeno chile peppers, garlic, cilantro, white sugar and lime juice. Cover and chill in the refrigerator at least 1 hour before serving. You've got to try this sweet and spicy fruit salsa. Great recipe & nice change. We were surprised that the fresh jalapeno chile pepper added flavor but not heat! This was good paired with grilled swordfish. I loved this recipe and served it with grilled chicken.I always use roasted jalapeno peppers in my hot sauces,btw.I used my own red raspberries,picked fresh from my garden. I made this salsa for a bridal shower and put it on chicken kabobs. I couldn't believe how yummy & fresh it tasted. I'll definately make it again. This sounded like a weird combo to me but it was delicious!! !